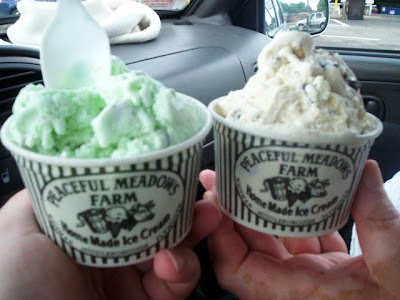 A couple of weeks ago , while running around doing errands , Laura says to me , " Ma , let's go to PEACEFUL MEADOWS " . " I don't want to go to a cemetery " . " It's not a cemetery " she laughs . " Well , I certainly don't want to go to a nursing home . You might tell them to keep me " ! MA !!!!! It's an ice cream shop !!! Oh , well why didn't you say so . Off we went . Off we went without our camera . Oh well . We drove to the one in MIDDLEBORO ,MA. 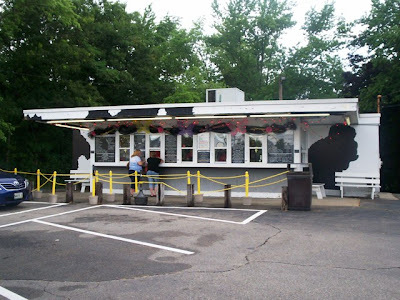 They also have locations in WHITMAN , MA. and PLYMOUTH , MA. Just as we got out to get our treats ( and mad because we couldn't film it ) it started pouring . Maybe this wasn't a good idea , but we were now determined . We both decided to get the same thing , the Fudgernutter What a Combo! Vanilla Ice Cream, Peanut Butter Sauce, Hot Fudge, Marshmallow, Whipped Cream & Peanuts. It was HUGE and udderly ( get it ? ) delicious . We deserved this ( we convinced ourselves ) , no camera , no review , pouring rain . Hey , we were due . We vowed right then and there to come back with camera in hand . CONES TO GO BAG - A pretty bag filled with 8 sugar cones, a plastic ice cream a scoop and a gift certificate for a 1/2 gallon of ice cream. STUFFED COW - A cute little bovine ! GIFT JAR - A decorated jar containing 20 sugar cones, a plastic ice cream scoop, and a gift certificate for a 1/2 gallon of ice cream. ... and so much more . So if you want a special treat or just a good old cone , visit one of their three locations . You'll be glad you did. The Middleboro location is open from 10 a.m. to 10 p.m. daily, except for Thanksgiving and Christmas. They are open from 12-10 p.m. on New Year's Day. 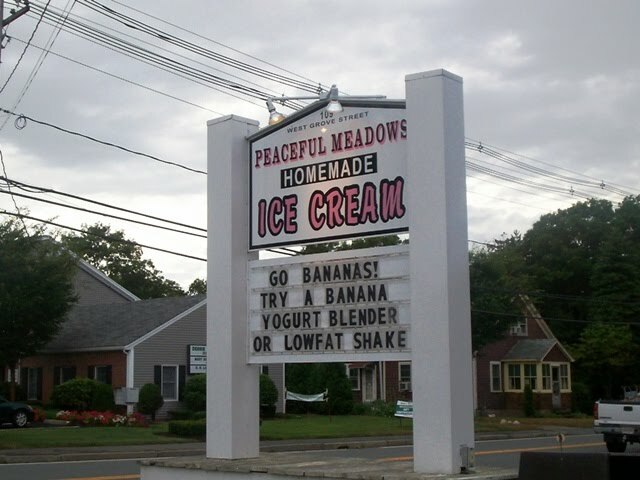 Peaceful Meadows also has locations on Route 18 in Whitman, and at 170 Water St., Plymouth. 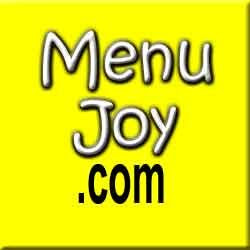 Don't forget to visit our friends at MenuJoy.com for a list of area restaurant menus.